Who else is a fan of leopard print?! When I spotted this sweater (haha), I had to have it and it made it’s way under the Christmas tree. But then I wondered–how do I wear it after Christmas? 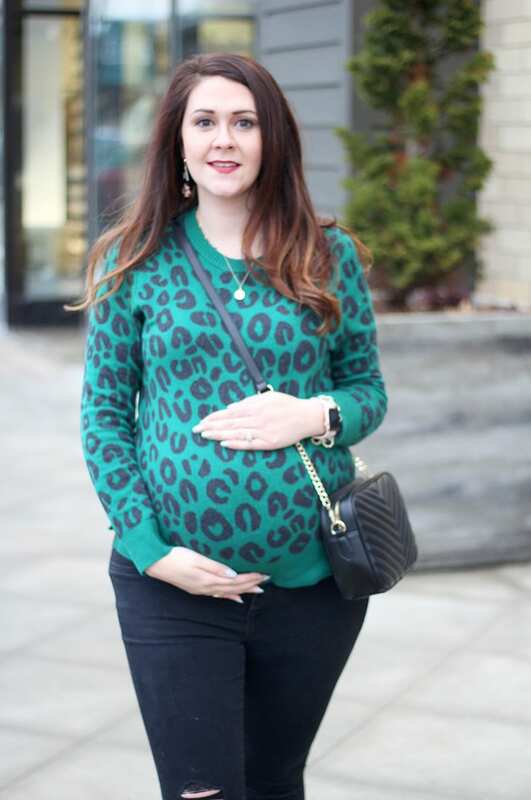 Sweater: Target (similar) // Maternity jeans: Old Navy (non-maternity version) // Loafers: Nordstrom Rack (similar, similar) // Earrings: Sugarfix at Target // Shoulder bag: Express–$35! I decided to start with my favorite black maternity jeans. 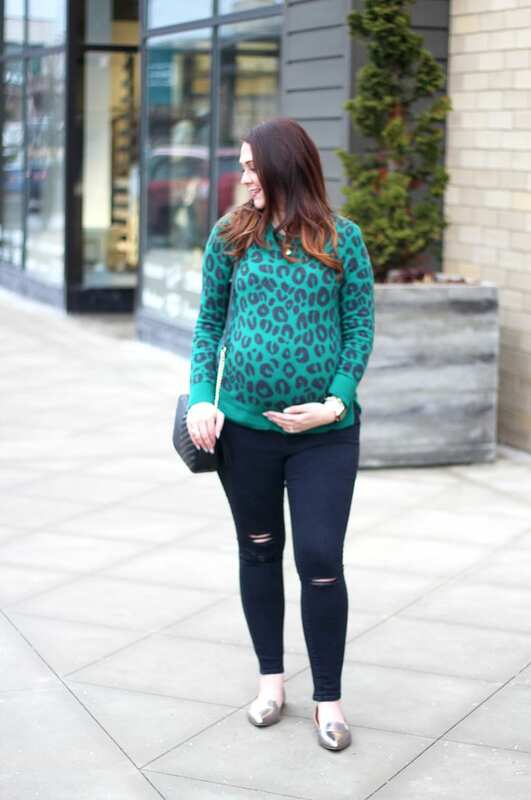 The maternity jeans I linked are identical except that they no rips, but I also linked the ripped non-maternity version as well. Everyone, and I mean everyone, needs a good pair of black jeans in their closet. Black jeans are a great option for a night out as they look a little dressier than regular jeans. Next, I wanted to lighten up the outfit, so I added these fun earrings that are black and white striped for $13! I highly recommend picking them up as they will work well into even summer for you. And loafers are still having their day (not that I’m complaining! ), so I slipped on a silver pair I picked up on our babymoon. Finally, let’s talk about this bag. It comes in 5 colors–I’m also wanting the blush, red, and pink–and it’s just $35! If you’ve had your eye on the Gucci GG Marmot shoulder bag but can’t bring yourself to drop that kind of cash, then you should definitely take a second look at this dupe. By the way, my sweater is non-maternity. 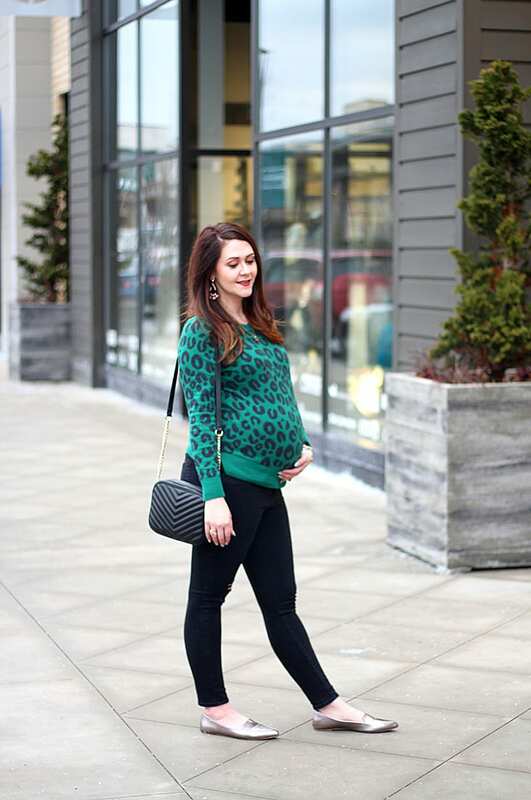 While I live and die by my maternity jeans, I’ve tended to make non-maternity tops work for me this pregnancy. I’m thinking of putting a post together on my tips for making non-maternity pieces work throughout pregnancy if y’all are interested! I don’t have black jeans! So you’re planning to wear non maternity the whole time? I guess with larger tops being in style that might work! 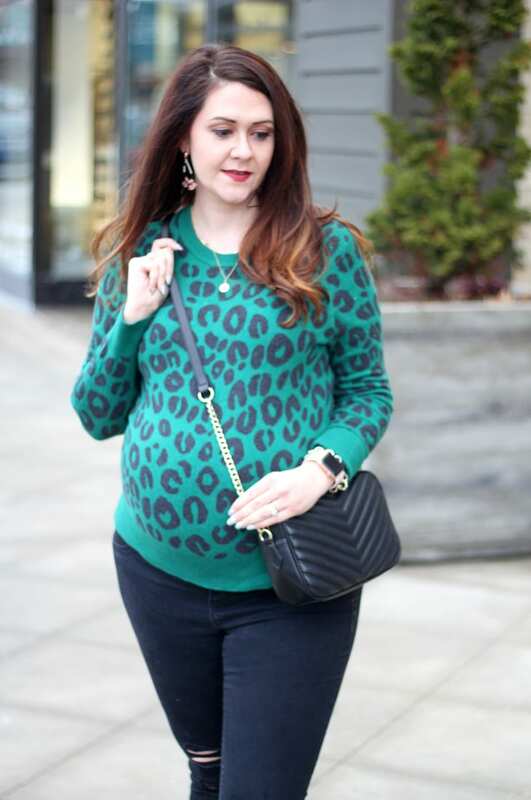 I’ve worn ALOT of non-maternity shirts, but I’m mixing in some maternity (like today’s post). And you should grab a pair of black jeans! 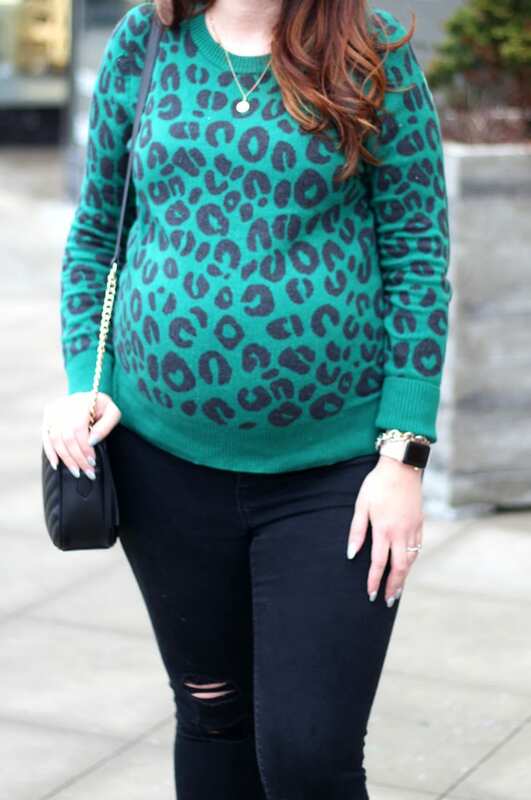 Beautiful sweater…and belly! Thank you for linking up on Fancy Friday! Thanks so much! It’s a great sweater, isn’t it?